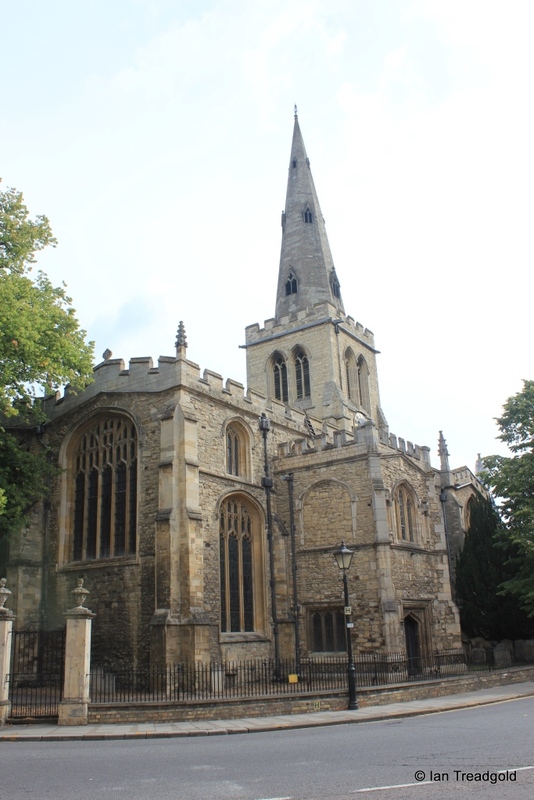 The church of St Paul in Bedford is easily the largest church in the town and occupies a prominent location in the square of its name. 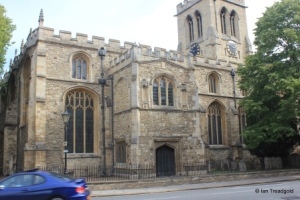 The church is situated centrally in the town, just north of the river and on the current A6 running through Bedford. Reference: St Paul's Church Bedford - An Outline History and Walk-round Guide to the Church - Booklet available from the church. 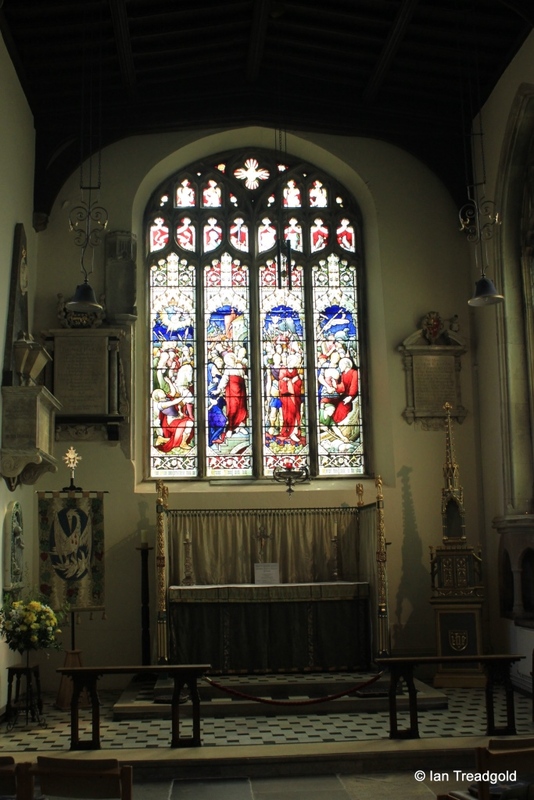 Much of the fabric of the church dates from C19 as major expansions and renovations took place in this period. Indeed for such an imposing building it is disappointing how little original medieval architecture remains. 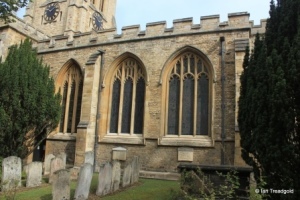 The church is of cruciform layout with a nave, aisles and transepts to north and south, a central tower and steeple with a chancel and the Trinity chapel to the south. 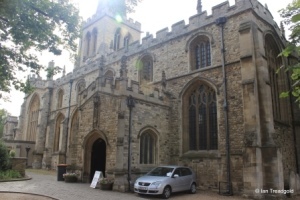 There are porches to north and south with a narthex or enclosed vestibule at the west end. 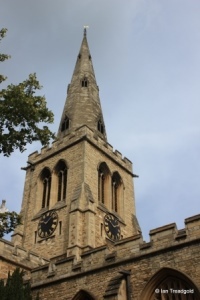 The church is 166 feet in length - exactly the same as the height of the steeple although the last 20 feet or so were added in the Victorian restorations. The aisles are the same height as the nave and the extra height is used to house clerestory windows to admit more light into the large interior space that results. The church has embattled parapets throughout. 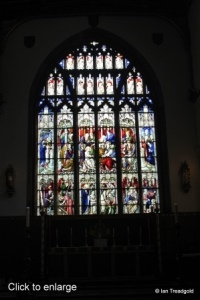 The south aisle has four south facing three-light windows of modern tracery in a C15 style. 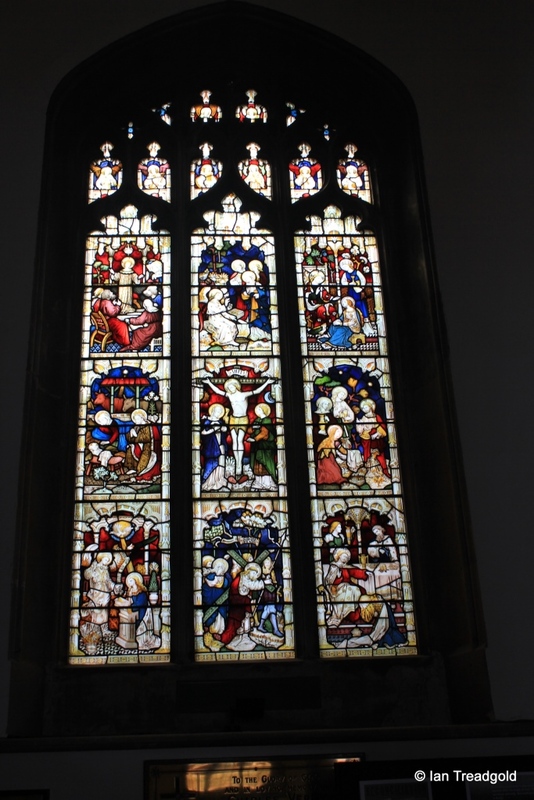 Above these are the five clerestory windows - the fifth being above the south porch. 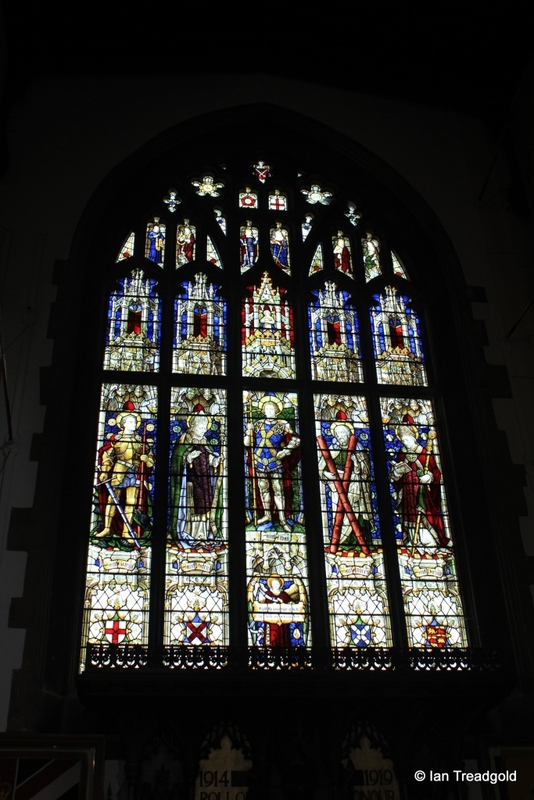 The south transept has a large window with five cinquefoiled lights with extensive tracery under a pointed head. 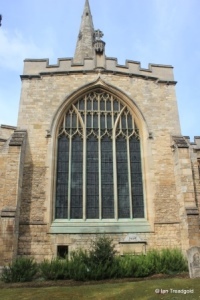 The south wall of the south chapel - the Trinity chapel has four modern three-light cinquefoiled windows with a priest's door in a two centred arch. 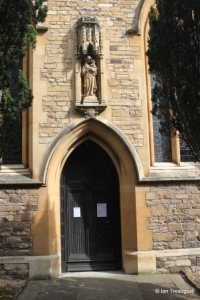 Above the door is a statue of the Virgin and Child. The sculptor's model for this statue is inside the chapel. 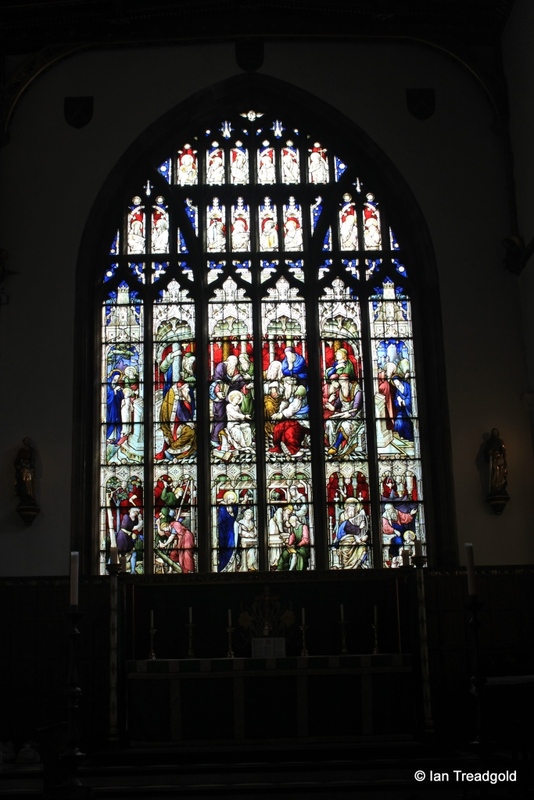 The east window of the south chapel - the Trinity chapel is of four cinquefoiled lights and the stained glass depicts episodes from the life of St Paul. 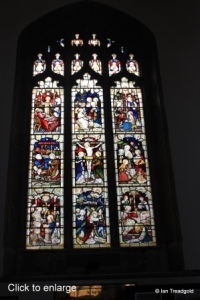 The west window of the south aisle whilst being of five lights is similar in style to the other aisle windows. 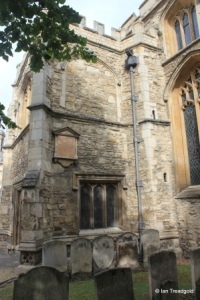 The south porch has two stories and dates from the C15. The outer doorway is in a four-centred arch with spandrels decorated with foliage, a portcullis and a ragged staff on a shield. 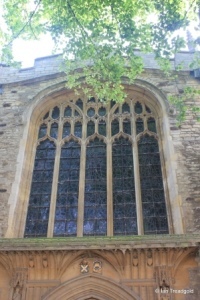 There are three-light windows under a square head to the east and west on the ground floor. 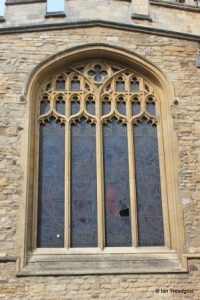 Above these to the east and west are blocked windows under four-centred arches. 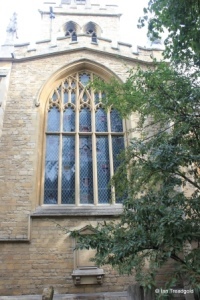 A matching window with three cinquefoil lights surrounded by statue niches is on the south side of the porch. The statues, of Saints Peter and Paul, are currently lying on a bench inside the porch after suffering exposure to the elements. 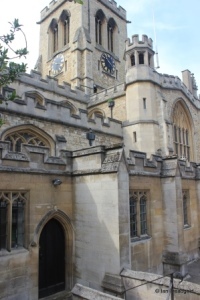 There is a stair-turret in the north-east angle of the porch. 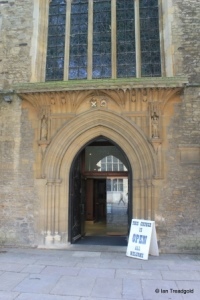 The main west door is modern and opens onto the enclosed porch or vestibule known as a narthex. 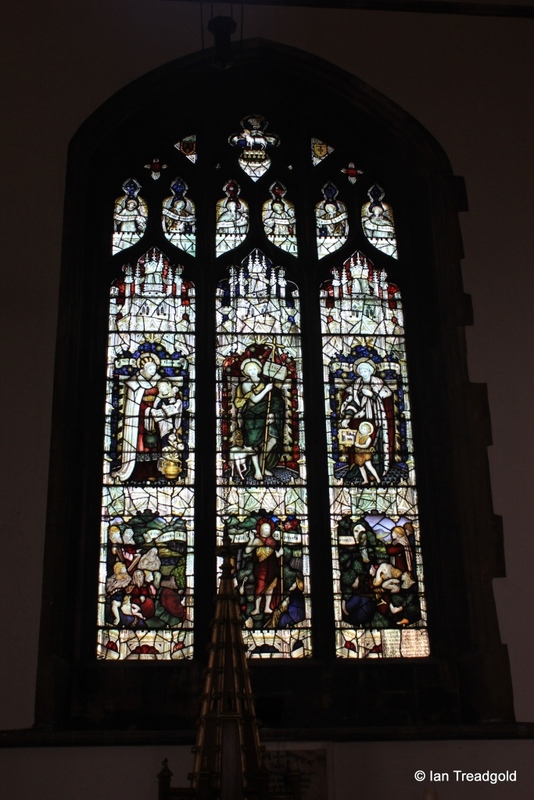 Above is a five cinquefoiled light window with modern tracery in a C15 style. 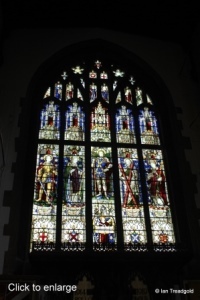 This window matches the west windows of the north and south aisles. 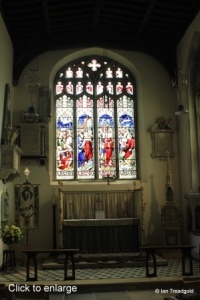 The north aisle is of a similar layout to the south - four three-light windows surrounding the porch with five clerestory windows above. The porch and aisle were built as part of the Victorian renovations. 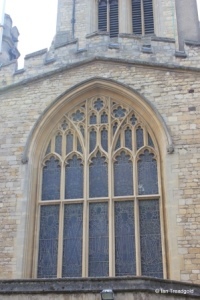 The north transept has a similar large window to that on the south transept although the detail of the tracery is different. 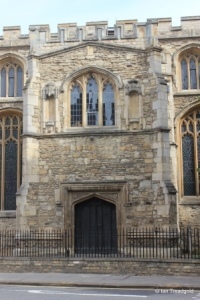 The location of the modern vestry below and to the east of the transept hides many of the features of this face of the church. 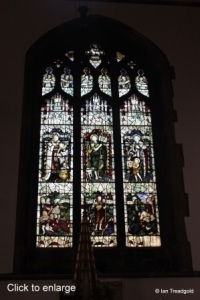 The east window of the chancel is modern but in C15 style consisting of six cinquefoiled lights under an ogee moulding. 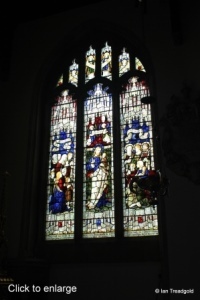 There is a gable cross above the window. 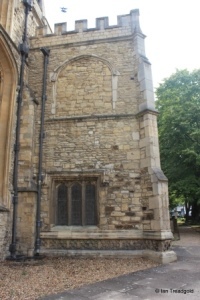 The tower has angle buttresses above the roof of the church with an embattled parapet. 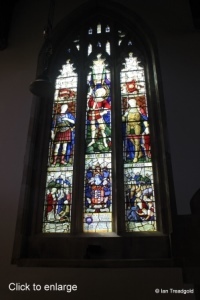 The belfry lights above the clock face are pairs of trefoiled lights under pointed heads. 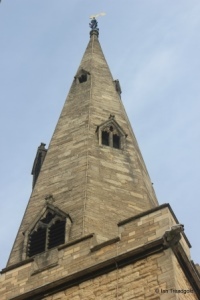 The spire rises above this in an octagonal form with three sets of lights alternating round the faces. 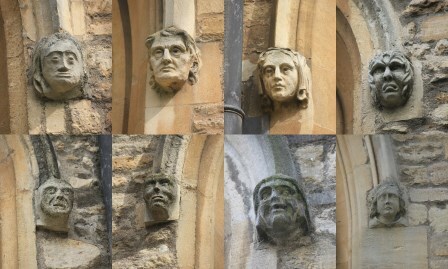 Many of the windows have carved faces in the corbels - here are a selection. 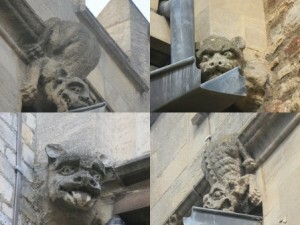 There are also several gargoyles and mystical figures carved as part of the roof drainage. The church has an extensive collection of stained glass in its windows much of it modern and dating from the late C19 and early C20. 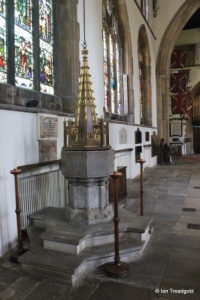 The font consists of a Victorian bowl sitting on a C14 octagonal shaft. The canopy above dates from early C20. 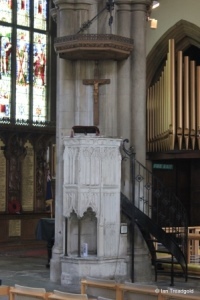 The pulpit probably dates from C16 and may well originally have formed part of the reredos of the Trinity Chapel before being refashioned into a pulpit. 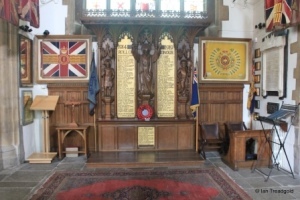 At the east end of the north aisle is an area dedicated to the Bedfordshire and Hertfordshire Regiment with memorials to the fallen of that regiment along with Regimental Colours that have been laid up. 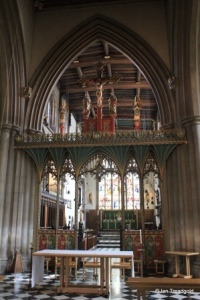 The cross on the English oak rood screen is surrounded by figures of St Mary and St John with two figures of angels on the outside. 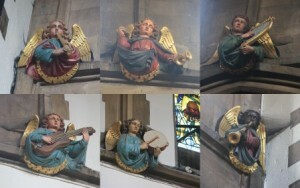 In the chancel, the corbels are decorated with fourteen angels playing instruments carved in 1884. 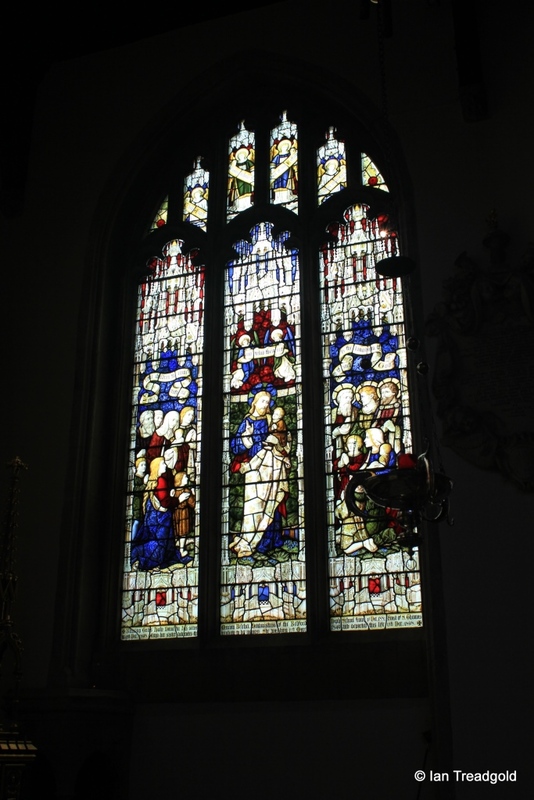 One of the angels is depicted with a black face at the suggestion of a member of the congregation who had worked as a missionary. The roof supports have carved wooden figures, each standing on an eagle. Page last changed 03/09/2014. Reformatted 26/08/2015.